Buzzards only come when something’s dead. Scholar Alfred Pockran observed that, "A crisis is the sum of intuition and blind spots, a blend of facts noted and facts ignored" in his work Culture, Crisis, and Change. 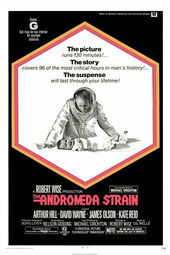 This is the heart of The Andromeda Strain and its emergency. The title sequence gives us the facts, inflicting upon us a prevailing sense of dread, and we intuit, correctly, that despite the reassurances of the preface, something wholly intolerable has happened. In Universal Titles/Attila de Lado’s colour-blocked sequence, a pulsating hum accompanies the revelation of the classified. The score, composed by artist, jazz musician, and composer Gil Mellé, is an innovative fusion of electronically generated sounds, traditional instrumentation, and musique concrète featuring buzz saws, trains, and bowling alleys, with dashes of white and pink noise. It’s also one of the first all-electronic motion picture scores. Along with this sonic language of devices, an onslaught of information is presented, superimposed, and mutated. The hums and beeps, syncopated and layered, abstract themselves into an ominous mechanical thrum – a soundtrack for graphic annihilation – as the truth dangles just beyond our reach.